1. Combine all the chopped fruits and grapes in a bowl. 2. Add the sliced bananas and sprinkle red chilli powder, salt, pepper powder. 3. Add the lime juice and toss to mix well. 4. Garnish with the pomegranate seeds. 5. Serve at once or serve chilled. 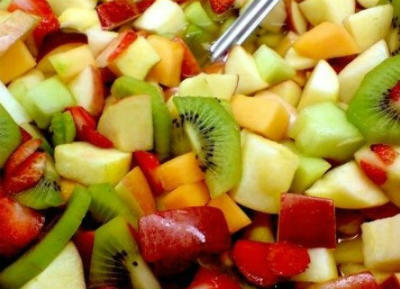 Tip: Apart from the mentioned fruits, feel free to experiment with fruits of your choice and taste. Feel free to comment or share your thoughts on this Spiced Fruit Cocktail Recipe from Awesome Cuisine.